Dr. Rajender Macha received his Bachelors of Science degree from University of Michigan, M.B.A degree from Michigan State University, and doctor of optometry degree from Indiana University. 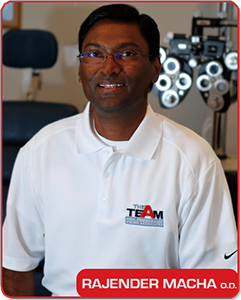 He opened up his private practice, Macha Family Eye Care in 1999. He along with 2 other doctors continue to work at this Anderson, Indiana office. He has two teenage children and wife of 21 of years. He grew up playing multiple sports and helped coach both of his kids in basketball, baseball, and softball. With interest in children and sports, he started Peak Visual Performance in early 2014. This clinic helps improve many visual deficits in patients of all ages and assist athletes in obtaining a visual edge over their competition.